Home / Creativity / Courage may be the most important of all virtues…. I was looking for a quote earlier last month and happened on this one also. The first thing that struck me about this image was her beautiful face with so much wisdom and yes courage pictured there. Next were her words and I knew I needed to share this and why it rings true to my spirit. I know I am not alone with setting intentions to start along a new path for improvement in my life with things I want to accomplish whether in this business, with my family and also my daily job. I want to be more consistent in blogging and keeping in contact with all of you. I want to be better with technology which scares me and puzzles as I try to navigate this computer without throwing it across the room in frustration. I want to keep better contact with friends and family and not just keep to my hidey hole saying I am too tired to do this or that. I also want to journal more- wonderful it would be to get back to writing my morning pages but for now showing up here will have to do! The problem with all intention setting is the push to actually pursue and do them! This is where I can fall flat on my face as that wonderful inner critic the procrastinator, comes in and spreads the words that I am too tired to do this or that and there is always tomorrow. 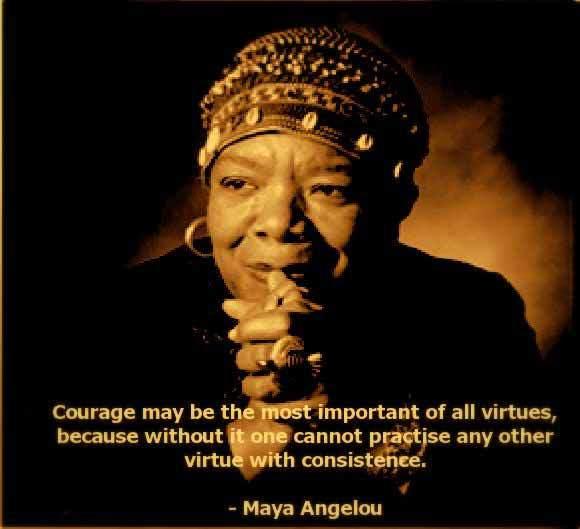 But there is an answer to that and that of which Maya speaks is Courage! Courage is the virtue that allows us to move forward with our intentions. Courage, encourages us to follow the path that we set out for ourselves and trust that the universe will be there to catch us if we fall. This can be our safety net that helps us as we push forward. Courage in our pocket allows us to pursue our goals and truly make them real. We need to acknowledge Courage in our life as she is there once we see her and ask her to accompany us on our life path. Where is courage in your life? I love the picture and inspirational quote on courage that you shared. Yes, her beautiful face reflects love, peace, wisdom and courage. I can relate to your post, I could use more courage to be more consistent on taking action toward my goals. Thank you.